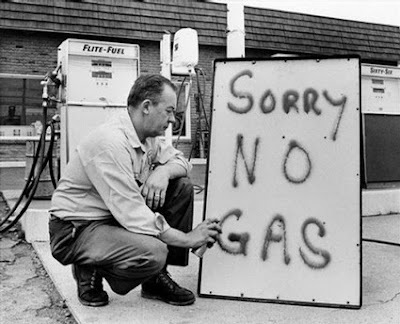 Here's a link to a peak oil related speech that I think is interesting. Should we avoid chaos in the event of reducing oil production and rising oil prices, we could end up recovering lots of jobs lost to globalisation and with more balanced economies. I think peak oil, as a reality or as a convenient propaganda theme to generate 'much needed inflation' is likely to happen so it's interesting to see it's impact. Erm the Chinese/Japanese are already looking into nuclear powered container ships. In fact the Russians already have some smaller ones. I posted about this about 7 weeks ago. Plus there is always backup. The Baikal Amur mainlane railway was designed specifically for this pupose! It is heavily underused the transiberia could be quadruple tracked too. Not to mention that China made some announement about a high speed rail link all the way to Europe. Also who says it will pan out like you say it will? I.e. companies have to move back? In that firstly companies might not even sell stuff to us when the currency is Zimbabwe style, secondly raw materials tend to come via big ships. Therefore if we have no raw materials how can we build anything here? We'll just get less and less stuff until the UK represents Gaza. Also if stuff is made here there is the automation problem, and even if some things can't be automated you can monitor and control processes from fast net connections from overseas. Also who says it will pan out like you say it will? I'm not saying anything, just listening to what that guy (who seems knowledgeable) says. He describes a more optimistic peak oil outcome that I am attracted to. I think NatGas ships are looking good for the future, although the current overcapacity will make investment in new ships a bit harder. As far as Nukes go, I have doubts they would be allowed to enter commercial ports that easily. We will not see peak oil in our lifetime or possibly for over 100 years based upon current global consumption. The price of crude will continue to rise, governments will continue to tax it, refined products and useage by the consumer. The USS Nimitz docked in Hong Kong a few months ago it was parked about 1300 metres from a residential district. Get a marine platoon onboard each gigantic container ship and problem solved. If there's buckets of it.....why should it continue to rise? Or are the buckets not easily accessible? western economies based on CHEAP OIL. Its rising because the [ ] used in exchange for the oil is slowly running out ..
You clearly don't know how peak oil is defined. We are there already and the oil majors are facing extinction within 25yrs. Go listen to XOM and Shell and BPs annual investors communications. They are all suggesting everything is fine and that reserves replacement ratios are at recent highs: what they don't focus on is the replacements are b.o.e. (barrel oil equivalent) for tar sands (bitumen) and shale gas. That means the majors are consigned to 'dirty' oil, and gas that's released by creating huge fracture networks using toxic fluids. When those fracture networks form, some create pipelines into the overlying potable water aquifers -then what? The answer is no one knows what large scale production will do to mother earth......big oil is getting desperate. With the greatest of respect I do. Exactly. EROEI is the key to all of this. Sure there is plenty of oil left... Tar Sands, Deep Sea, Oil Shale etc. It will be just too expensive to burn. For those ostriches who believe that some miracle tech will replace oil... wake up. at least not in the context of what increses in oil prices will do to the global economy. look at what happened when oil hit $180 barrel. in terms of oil all the low hanging fuit has been picked. cheap energy will be a thing of the poast within 5-10 years. I sold at $179, a good call if I say so myself. I trade the stuff, physical and paper. Fundamentals are that oil today is likely overpriced by $30 approx based upon speculation. OPEC producers 2 weeks ago revised their reserves, some with evidence, some without. There is no shortage of crude oil, only at the current price. Carry on believing what you will old stick but don't spread alarm where there is none. What price is too expensive ? Bardon, you have hit the nail on the head. You trade physical oil.. interesting. Do you own an oil taker? When our oil-dependent, long-distance lifestyles become untenable. That's when. Can use tankers as floating storage obviously, freight rates remain weak. Very tough markets at the moment especially in Europe. Chinese imports up again at 8.7% year on year. Refinery margins improved dramatically as 11 of the 12 French were effectively shut. The Gasoil boyz have made a ton of money over the past 3 weeks. Price being $35 per ton over Platts pricing. They'll have a good Xmas. Won't bore you any more! 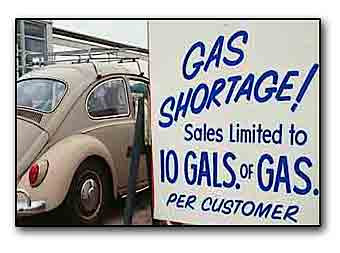 Peak oil is not about oil running out. 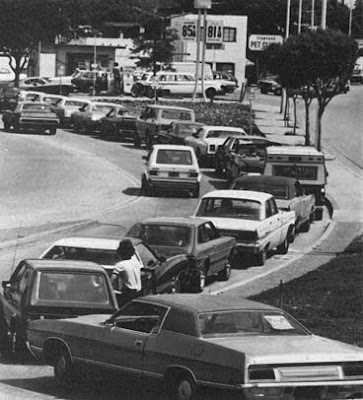 Peak oil is about how supply stops rising and begins to decline. This, in the face of undiminished demand, causes the price to inexorably rise. I was hoping that you would put a monetary figure on it. It may be that there is no maximum price after all. Personally speaking I just can't see a problem with supply. We also have new techniques for extracting different forms of hydrocarbons and these methods will now start taking up market share. There is no end in sight. Such as, and extracted from what, and where is this resource? Of course there is an end in sight, we just can't judge the distance, and our speed of approach keeps varying with economic vicissitudes. After all, the US and UK peaked in oil production long ago, in fact 60% of the world's current oil production has already peaked, and 40% is still growing (yet to reach peak). Note the UK's precarious position in the table below, 47% off-peak. Do a screenshot of the table in the website in question, then up load it to something like photobucket and link as an image. 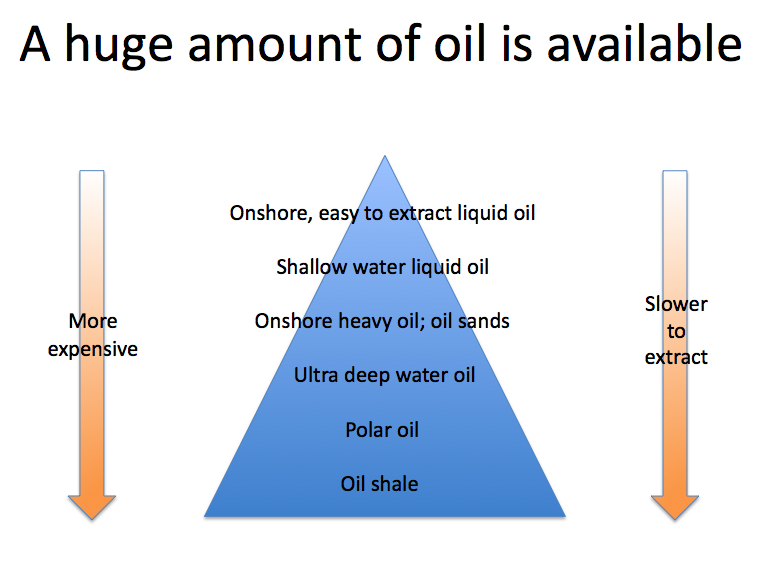 So, onshore crude oil is easier and cheaper to extract than offshore or shale is it? Would you please explain the differences in speed-of-flow and EROEI for these different sources relative to demand? Yes, but there is a slight difference between political/military and commercial isn't there. But, uh, sending something thousands of miles by boat is generally cheaper than sending it hundreds of miles by truck.